Born in Panama City on July 31, 1968 to parents Manuel J. Castillo and Moty Garcia. In her educational formation, Lorena Castillo de Varela, studied at the Flint Hill School in Oakton, VA. She obtained a Bachelor´s degree in Journalism at Universidad Latinoamericana de Ciencia y Tecnología, ULACIT. (Latin American University of Science and Technology). She speaks English and French. Lorena worked as a journalist for 17 years. Between 1991 and 2009, she was a presenter and co-producer of news in Telemetro Reporta, television channel of the Medcom Corporation. In 2002 she won the National Journalism Award given by the Forum of Journalists, with the report of Disabled Children in Cuba. In that same year, she was awarded as the Presenter of the Year with the Victoria Prize, given by the Santa Maria La Antigua University. She was presenter of various television programs, among them “The grandfather of my grandmother”. 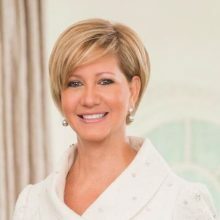 In 2003, as Executive Secretary of the National Committee of the Centenary of the Republic of Panama, she led the team responsible for organizing the celebrations of the Centenary of the Independence. Worked as a News Correspondent at the White House, United Nations, the Organization of American States OAS, and the Vatican. In the exercise of her profession, Mrs. Castillo de Varela, toured the country, experienced poverty closely and was able to help hundreds of families who changed their quality of life. In 2007 she was the presenter of “Roofs of Hope”, a television program through which decent homes were built for the Panamanians who were forgotten by progress. Committed on matters of humanitarian and social support, with The National Cancer Institute, Children and Santo Thomas Hospitals, and Nutre Hogar Foundation, a private organization created in l988 by Monsignor Rómulo Emiliani and a group of volunteers in order to recover and prevent severe malnutrition of children from the most impoverished communities in the country. In 1992 the First Lady married President Juan Carlos Varela Rodriguez. The Varela Castillo marriage has three children: Gian Carlo, Adrian y Stefan. Castillo Varela has combined her professional career as a journalist, her role as mother, wife, and her vocation of social service. Devotes part of her life to strengthen social solidarity and to the integral development of families. As First Lady, Mrs. Castillo Varela is committed to develop programs to benefit the most vulnerable sectors of the population and working to serve all Panamanians. In her role as UNAIDS Special Ambassador for Latin America and Global Spokesperson of the Zero Discrimination Movement, she leads initiatives with the aim of creating a climate of respect, solidarity and inclusion, where all people can live without fear of being attacked, criminalized or stigmatized. Mrs. Castillo de Varela has managed to add to this movement to authorities, representatives of civil society, sports, celebrities, people living with HIV and key populations. The First Lady also promotes gender equality, empowerment and the inclusion of women in their different facets. “For every woman empowered in a community, that community grows, improves, because we are the heart of the country,” she insisted. The empowerment of women is one of the three pillars of management of her Office, from which work is done to generate better opportunities and improve the quality of life of women so that they can transform their lives, those of their families and contribute to economic and social development of the country. The First Lady is part of the group Laureates and Leaders for Children, through which they refine and establish strategies to eliminate child labor, guarantee and ensure the full exercise of the rights of children.